We’re delighted to announce that we’re supporting the Cots for Tots’ 2016 Christmas Stocking appeal. Cots for Tots is a Bristol-based charity that is committed to supporting the families of sick and premature babies in Bristol’s special care baby unit at St Michael’s Hospital. As well as fundraising for life-saving equipment and new facilities, Cots for Tots runs its own dedicated 12-bedroom house – the Cots for Tots house. Located directly opposite the hospital, the house provides accommodation for families of babies being treated in the special care unit. The house costs £300 a day to run and is completely funded by the Cots for Tots appeal. “We’re delighted to be supporting Cots for Tots Christmas stocking appeal. It’s an honour to be involved and all of the staff at Barcan+Kirby feel proud that we’re giving our support to such a worthwhile initiative. 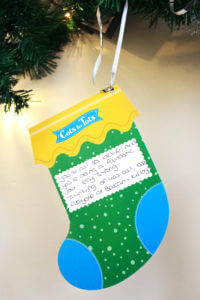 If you’d like to make a donation or to display a message on a stocking at Cots for Tots’ house, visit their website or call 0117 927 3888. It’s an honour to be involved + all of the staff at Barcan+Kirby feel proud that we’re giving our support to such a worthwhile initiative.